With each passing year, the odds get worse that climate change mitigation efforts will be able to stave off catastrophic warming of more than 2 degrees Celsius, or 3.6 degrees Fahrenheit. A new study published on July 31 in Nature Climate Change is the opposite of reassuring when it comes to this math. Using statistical tools, the authors found that there’s a 5% chance Earth will warm 2 degrees or less by the end of this century and a 90% chance that temperatures will increase from 2.0 to 4.9°C if historical trends continue unabated. The other 5%, well that’s worst-case scenario runaway global warming—the kind of thing that keeps geoengineers up at night. As for the ambitious 1.5°C target included in the Paris Agreement, there’s apparently only a 1% chance of meeting that (not so surprising considering the planet has already warmed 1°C since pre-industrial times). So as climate change deniers like President Trump, EPA chief Scott Pruitt, and many GOP lawmakers put their money on taking little to no action and somehow escaping devastating warming, in truth it will take a herculean global effort to avoid costly and harmful impacts. The reality of human-caused climate change is increasingly clear for anyone to see. Last year was the hottest year on record, and the 12 warmed years on record have all occurred since 1998. 2017 is on track to be the second-warmest year on record; and this even in the absence of an El Niño warming event like 2016's. According to NASA, the first six months of this year were 0.94°C above the 1950–1980 average. Meanwhile, CO2 levels are are 25 percent higher than they were in 1957, and still rising. As the atmosphere continues to rapidly warm, weather patterns will shift dramatically—leading to more flooding, drought, and severe storms—sea level will rise, and humankind will be forced to adapt to a broad range of climate change-driven challenges both at the global scale and in countless local contexts. 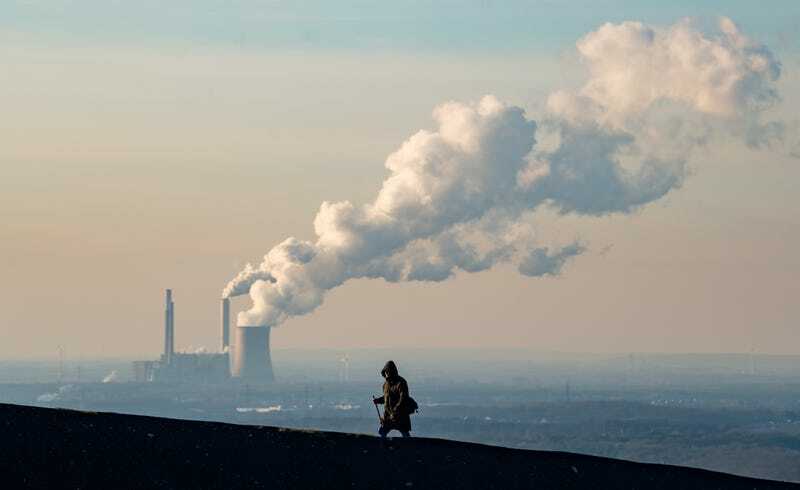 For instance, one recent study found that if emissions are not slowed and the planet warms 3-5°C above pre-industrial levels by the end of the century, climate change will make the United States “poorer and more unequal,” with the poorest third of counties across the country potentially sustaining economic damages costing as much as 20% of their income. The faster emissions can be reduced, the more of a chance there is to avoid the most debilitating of these impacts. In determining the warming trajectories, the authors focused on three main factors underpinning future greenhouse gas emissions: total world population, gross domestic product per person, and the amount of carbon emitted for each dollar of economic activity, known as carbon intensity. Using statistical projections for these quantities based on global data gathered over the last half century, they found a median value of 3.2°C (5.8 F) warming by 2100, and a 90% chance that warming this century will fall between 2.0 to 4.9°C (3.6 to 8.8 F). Richard Startz, an economist at the University of California at Santa Barbara who worked on the study, told Project Earth the most surprising finding was that population growth will not be a major factor in increased CO2 emissions over the course of the century. This is in large part because most of that growth will occur in Africa, where per capita emissions will remain relatively low. What matters a lot more for future warming is actually carbon intensity. According to the study, even though carbon intensity has dropped in recent decades as countries increase energy efficiency and enact carbon-reducing policies, it will need to drop much more to see the kind of progress the global climate community is aiming for with the Paris Agreement targets. Startz said in his opinion there are two primary ways to accomplish this: Financial incentives to reduce carbon emissions—like carbon taxes or cap-and-trade programs—and a lot more support for scientific research that would help reduce emissions.